When I first read that one of my favourite bloggers was releasing a book, I instantly began impatiently refreshing Amazon’s UK Kindle site until they let me pre-order All Over The Place. I’ve followed The Everywhereist for years after following a link to it from an article her husband wrote on the Moz blog, right back when I’d just dropped out of university and started working in marketing. (I find it a little soothing that I’ve just finished her book and my undergrad. degree.) 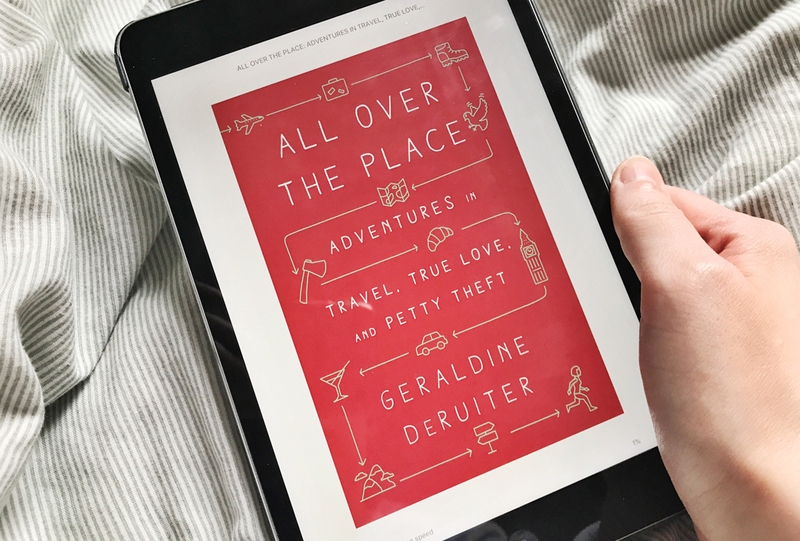 Geraldine’s blog was a bit of a beacon in the blogosphere for me because she was unashamedly traveling her way, getting lost, experiencing things her way, and telling hilarious stories about all of it. Her book is no different. This is a book that oozes comfort. The writing is so natural and effortlessly funny that you sink into the book and feel like you’re sat in a cafe (eating cake, of course) with Geraldine. If, like me, you find yourself constantly living in fear of everything, you will also find another kind of comfort in this book. I found myself laughing out loud and pondering my own experiences as I read about Geraldine navigating her life, the relationships with her partner and family, her health, and her thoughts on life and the “path” we’re on. One reviewer on Goodreads summarised this book really well for me, “All Over the Place is a travel book, except that the travel is at least as much internal as it is external.“ It’s not just about the places she, her husband, or friends explored; it was about what she learned about herself, life, her family, her husband, and her friends. As you reach the end of the book, Geraldine takes her husband to the Italian towns her grandparents came from. She tells a story of meeting relatives and Italian dinners and it honestly feels like you’re sitting right there at the table. You can almost smell the pasta (and that is an excellent quality for any book to have). I reached the end of the book feeling thoroughly satisfied. All Over The Place was everything I thought it was going to be. If you’re looking for something hilarious, but with some poignant life lessons, to read this summer this is the book you need in your life. In fact, I think it would be the perfect book to read while traveling because it is so easy to read.